If you are traveling from outside Houston for cosmetic surgery with Dr. Camille Cash, we can arrange for a number of private concierge services. 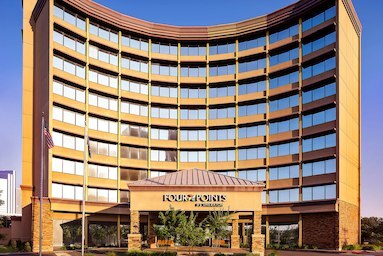 Quality recovery accommodations are available through our association with local hotels such as the Four Points by Sheraton Houston Greenway Plaza. Dr. Cash’s staff can also arrange for an experienced private duty nurse to care for you in your hotel room. Let us help you make your stay a pleasant and memorable experience. For assistance in managing travel arrangements and accommodations for your plastic surgery in Houston, TX, call our office at (713) 571-0600 or send us an email. One King or Two Queen Beds, chair with ottoman, large work desk, wireless access, high speed Internet, phone with speakerphone, voicemail, refreshment center, coffee maker, mini fridge, iron and ironing board. From Intercontinental Airport (IAH): Get on I-69 from Will Clayton Pkwy, Follow I-69 to SW Freeway Service Rd/Southwest Fwy in Houston. Take the exit toward edl/Buffalo Speedway from I-69 and Continue on SW Freeway Service Rd/Southwest Fwy to your destination. From Hobby Airport (HOU): Exit Hobby Airport and follow the directional signs to I-45 North. Continue on I-45 N then take I-69/US-59 S to SW Freeway Service Rd/Southwest Fwy. Take the exit toward edl/Buffalo Speedway from I-69/US-59 S. Continue on SW Freeway Service Rd/Southwest Fwy to your destination.